Meet us at OHBM in Geneva, Switzerland! Christiane will be presenting a poster about her current research on: "Cerebellar functional connectivity predicts childhood ASD and ADHD traits". Presentation time is Tuesday, June 28, from 12.45 to 14.45, though the poster will be up both Monday and Tuesday. Her poster # is 1107. We're very happy that Manu's work on shape and volume differences in Autism Spectrum Disorder is now published in Neuropsychopharmacology. Feel free to check it out here or by clicking on the picture below. It's open access. We collaborated with Dr. Mallar Chakravarty's group at McGill University who developed the MAGeT Brain algorithm for automated image segmentation. This allowed us to investigate volumetric and shape differences in a large pool of participants (N=757) taken from the Autism Brain Imaging Database Exchange. We're very happy to have four motivated summer students in our lab this year! Kristina and Logan (middle and right, both Health Sciences) will be helping out with our ASD Learning study for which they will be using DTI and EEG. Anish (left, UAlberta) and Prayash (Biological Sciences) will be working with Christiane on our visual attention study. Manu will be presenting her fMRI project at the 38th International Symposium of the Groupe de recherche sur le systeme nerveux central (GRSNC), "The neuroscience of decision-making". Congratulations to Christiane and Dennis! ...for receiving funding by the NSERC CREATE i3T Program! 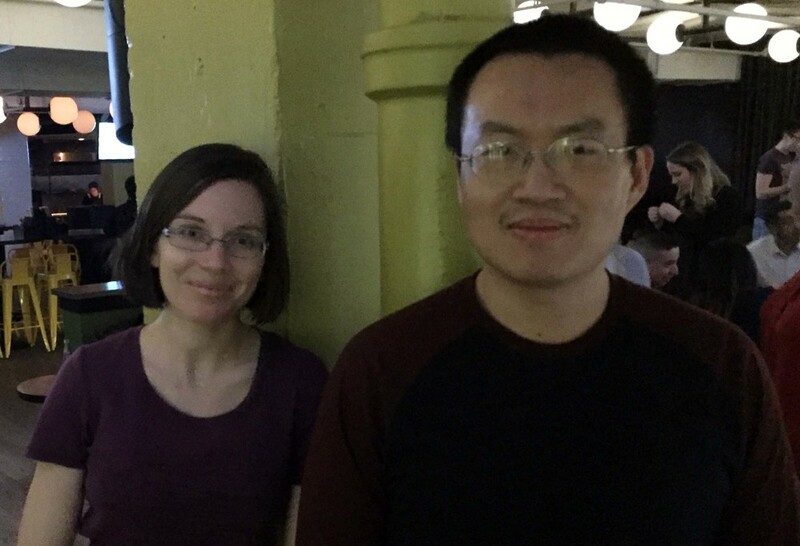 Christiane was awarded a postdoctoral fellowship and Dennis a graduate studentship. The CREATE I3T Program is intended to prepare trainees to be future academic and commercial leaders, by providing them with cutting-edge technical skills and knowledge in Medical Imaging. Read more about it here. Meet us at CNS in New York! Kari will be presenting a poster at the annual meeting of the Cognitive Neuroscience Society. You can meet her at the poster session on April 3rd, between 5-7 pm, where she will be presenting her work about associations between superior longitudinal fasciculus structure and attention skills in early childhood. As part of the Child and Adolescent Imaging Research (CAIR) Program at the Alberta Children's Hospital, we are lucky to work together with four scientists who are specialized in pediatric neuroimaging. Check out the CAIR website here. That also means great opportunities for socializing after work. We had our first CAIR social event last week. ... for winning this year's Queen Elizabeth II Graduate Scholarship! The scholarship rewards the high level of achievement of students pursuing graduate studies in Alberta. ...for a seed grant to probe applications of non-invasive brain stimulation using tDCS. We look forward to collaborating with Dr. Kirton! Christiane will be presenting her work on functional connectivity during early development at the 45th annual meeting of the Society for Neuroscience, October 17-21. Thank you to the Alberta Children's Hospital Research Institute for awarding her a travel award to attend the meeting! Let's take a break in the mountains. For this year's hiking trip of the CAIR program, we went to Grassi Lakes in Kananaskis. For some of us, the best thing about Calgary is how close it is to the mountains and it was wonderful to leave the city on Monday morning and spend a relaxed day in nature. Come and meet us at the 16th Annual Allies for Autism Family Walk/Run. Some of us will be running the 5k race and we'll bring some cool brain drawings to colour, as well as bubbles and other fun things for the kids. Looking forward to it! UPDATE: We had an amazing time at this year's Allies for Autism Walk/Run. We had some true artists coming to our table and were impressed by kids who could name some of the lobes of the brain. Manu and Signe enjoyed the run through beautiful Fish Creek Park and Signe even won the 10k race. Congratulations. A big thank you to Allies for Autism for organising this event and connecting people. We're looking forward to next year. ... for being an awesome Summer Student. Siena worked with ASL data that we collected at the 3T MRI Scanner at the Alberta Children's Hospital and helped out scanning new participants whenever possible. She gave a great oral presentation at the Seaman MR Center on "Quantifying cerebral blood perfusion in adolescents with Autism Spectrum Disorder using arterial spin labeling" and her abstract was chosen for a poster presentation at the ACHRI Summer Student Research Day. We have been collaborating for over a year with Dr. Mallar Chakravarty on a project examining volumetric differences in subcortical structures in Autism Spectrum Disorders. Manu is currently visiting his lab where she will learn how to use the tools his group developed to do automated segmentation on subcortical structures from a multi-site dataset. Besides the research, she's enjoying some real poutine, exploring the city and being able to brush up her French a bit. We would like to thank ACHRI for funding her stay at the Douglas Institute. If there was an award for research assistant of the year, Sarah would get it. Sarah has been in the lab for 1 1/2 years and has made huge contributions to our projects. We're especially grateful for her help with the recruitment and testing of participants for both our "ASD Learning" and "Visual Attention" studies. Her work on functional connectivity during childhood and adolescence was published in the Journal of Developmental Cognitive Neuroscience. If you haven't checked it out yet, click here. We will miss her and wish her all the best for her future! Yesterday was a big day for the Bray Neuroimaging Lab: Mark successfully defended his Master's thesis titled "Modular Development of Gray Matter in Childhood and Adolescence". He investigated network development in the healthy human brain during childhood and adolescence and looked at a data set of over 400 typically developing participants. In particular, he analyzed whether surface area, cortical thickness and volume undergo different developmental trajectories and show differential synchronized developmental patterns. Mark started his Master's project in Biomedical Engineering in January 2014 for which he was awarded an NSERC studentship. He was part of the NSERC CREATE International and Industrial Imaging Training (I3T) Program, which is designed to train highly qualified personnel who will drive the future of Medical Imaging in Canada. We're sad to see him leave, but also excited for him to begin the next phase of his education at the Schulich School of Medicine & Dentistry at Western University this fall. Kari Parson is a perfect example of an artistic scientist and we are happy that her art will decorate our meeting room from now on.